Something new is happening. Strange and wonderful. 8 years coming. From a stupid pun to a whole new way of doing what I do. However long it has consumed my attention, a whole bunch of something new is coming soon. This article appears in the summer 2016 edition of the Ferndale Friends magazine. Select the Press Release button below ​for more information regarding the recently released LP "Bedroom Sessions"
Have you ever wondered what it would sound like to cross bluegrass, thrash metal and a ringtone of the theme song to Quantum Leap? Neither did Ryan Cox (aka THE GOOD THINGS). That would be stupid. He has, however, created an endearingly broken brand of retro poppery: bluesy, folkified, melted over a slice of psychedelia and deep fried in soul. This musical misfit came sneaking onto the Detroit scene in 2005, playing dingy garage-rock in even dingier bars with The Red Rocks. In 2006, they split and he soon formed THE GOOD THINGS. Originally featuring John Morales (Ten Mile Tide, Dad's LPs) on drums and local friend Steven “Sauce” Decker on bass, they found themselves a comfortable groove during the indie-rock boom with a bit of a vintage take on things. Despite overwhelmingly positive press and a dedicated following, the trio fell victim to circumstance and disbanded in late 2008. After a couple of years of development and procrastination, and a few weeks of intoxication, Cox began reviving and re-engineering THE GOOD THINGS as his personal musical pseudonym. Inspired by John Lennon’s famous “Tuba” quote, he’s using whatever he can get his hands on to make his good things. "I prefer working with instruments I'm not so sure about. I mean, I'm not much of a guitar-player, but I am technically a guitarist. But I'd much rather have something I don't know how to play in my hands. Always in exploration-mode. Like a kid. Like when I used to trap myself in the basement with a guitar to find out what sounds could come out of it. I love not knowing what the hell I'm up to. Never know what's gonna come out." “I don’t know how to play the piano, so I went and bought one and started writing with it until things began to sound less and less awful. I'll play a part until it's decent enough to put a microphone on it, but after I record it, I couldn't play it again next week if you paid me!" "But it’s more than that. I used to criticize people who used loops and digital effects and really anything that came out after the 70s; it was the height of my indie-pretentiousness. But now, pretty much everything’s fair game. If I can find something that sounds good, I don’t care where it comes from or where it’s been or whether or not I can play it. Sometimes kicking the wall works better than a bass drum. Or making trumpet noises out the side of my mouth fits better than a brass section. The record I'm on now, I garbage-picked the drums; I found the microphone I used on the piano in a house I used to rent; I laid down a backbeat with a plastic recycling bin. I just realized how poor I sound. Garbage-pail music. Garbage pop." Determined to start from scratch and get THE GOOD THINGS back into the mix, Cox released some free home-made singles here and there in 2010 and 2011. 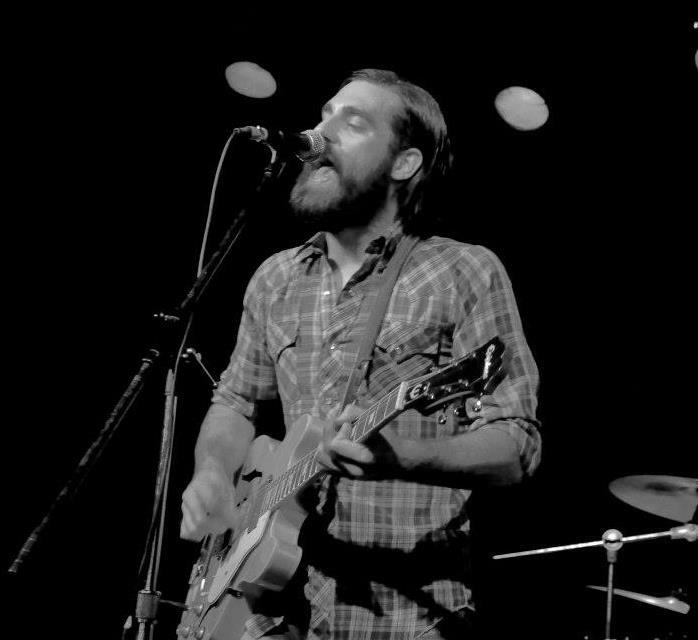 Wanting to make his first LP but lacking the funds to do so, he began a Kickstarter (fan-funding website) page and was able to raise some cash (what he thought he needed to make the album himself). 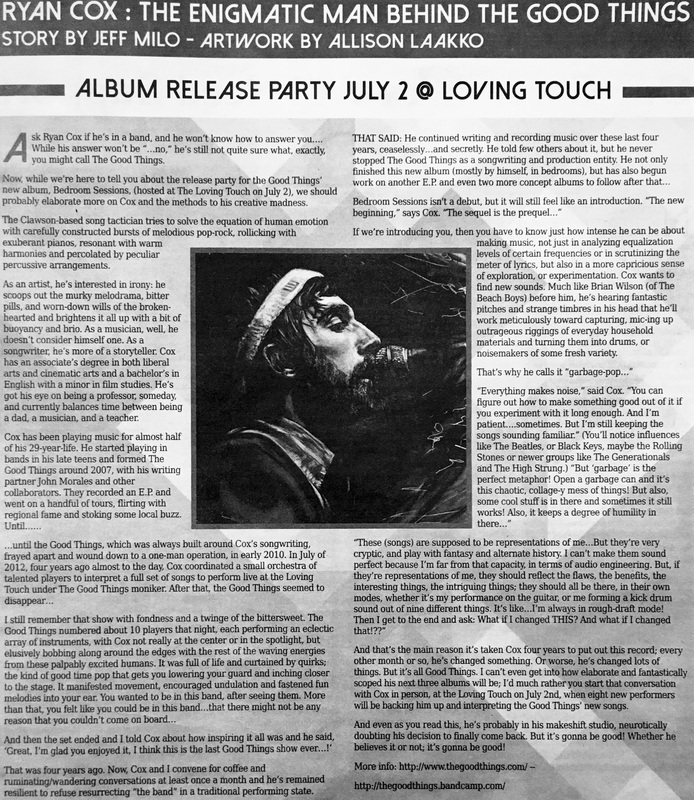 Now, the LP—now known as "Bedroom Sessions"—is complete, its release commemorated with a performance party at Ferndale, MI's The Loving Touch on July 02, 2016. Immediately, Cox began work on his next LP. And it is quite a big project! As he says, "Something weird is always in the works."